Perhaps the best site for Pleistocene fossils in Arkansas is Peccary Cave located in Newton County. The site was first excavated in 1960s, and a follow-up expedition prospected for fossils again in the early 1990s. The fossil remains of at least 51 species of mammals have been found here. 4000 specimens of a minimum of 64 individual flat-headed peccaries (Platygonus compressus) were discovered in the cave, hence the name. The bones of other extinct species excavated from the cave include mammoth, mastodon, bison (Bison antiquus), stag-moose, helmeted musk-ox, tapir, beautiful armadillo, and dire wolf. There are also remains of extralimital species found here that no longer occur in the region–grizzly bear, pine marten, porcupine, heather vole, and numerous other rodents and insectivores of northern affinities. Plenty of species still found in the region are represented in the cave as well such as beaver, otter, muskrat, raccoon, coyote, gray fox, opossum, and either mule or white-tailed deer. Reptile and amphibian specimens have been excavated from the cave along with a few human-made artifacts of unknown cultural origin. 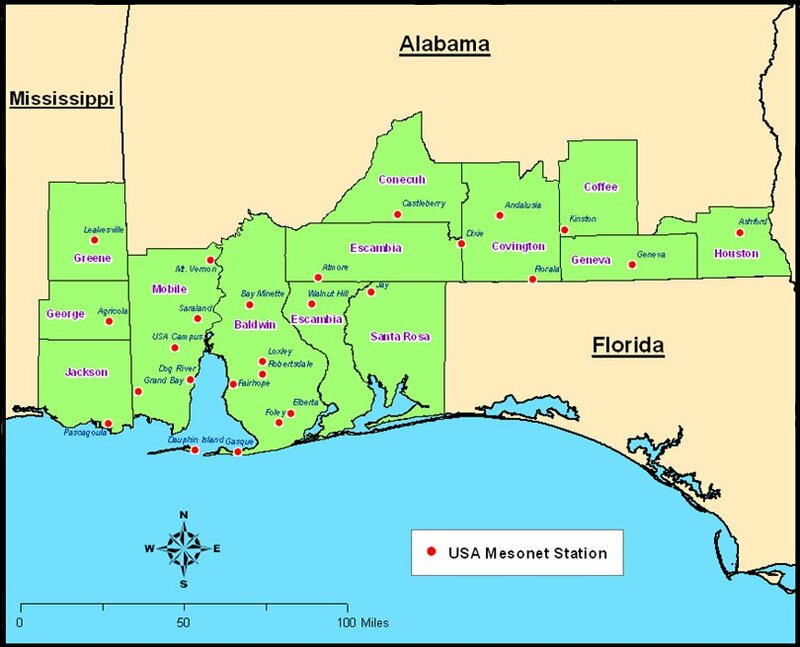 Newton County, location of Peccary Cave. Illustration of the flat-headed peccary. Peccaries didn’t use Peccary Cave as a den. Instead, they either fell inside or their bones were washed into the cave when the nearby creek flooded. Birds of prey dropped or defecated smaller animals into the cave from overhanging trees. The fossils represent several different climate phases. The lowest level contains fossils over 22,000 calendar years BP, a climate phase that includes a weak interstadial and the following early glacial maximum. Mixed Ice Age woodlands of spruce, pine, and hardwoods interspersed with prairies predominated. 7 different species of squirrels lived in the region then, showing how many diverse habitats occurred here. Red squirrels and least chipmunks, now absent from the region, preferred spruce forests; gray squirrels, fox squirrels, and southern flying squirrels occur in temperate hardwood forests; woodchucks like meadows; and 13-lined ground squirrels require tree-less plains. The author of the study discussed below thinks the following glacial maximum caused the entire Missouri Plateau to become inhospitable desert because there are few fossils from the site, dating to between 21,000 calendar years ago-15,000 calendar years BP. Undoubtedly, the region became more arid during this climate phase, and desert scrub grassland likely predominated, but I think there are alternative explanations for the lack of fossils during this time period here: a) the cave entrance may have become closed and/or b) the barren landscape allowed animals to see the trap entrance and avoid it whereas before it was hidden by thick vegetation and animals frequently fell inside. Without overhanging limbs there was no perch for birds of prey to drop of defecate the remains of their meals. Moreover, the nearby creek dried up, so there were no floods to wash fossils into the cave. The upper level of sediment represents a warm dry interstadial post 15,000 calendar years BP when the region was dominated by grassland. Bison fossils appear during this phase, and toad fossils outnumber frog bones. Toads can survive better than frogs in more arid climates. Kurt Wilson wrote his PHD thesis about the peccary and dire wolf bones found in Peccary Cave. His paper has interesting information, but it is incompletely researched, and his conclusions are logically flawed. He believes flat-headed peccaries were always an uncommon species. Part of his reason for this assertion is based on his incorrect observation that “the southeast is virtually devoid of records (of flat-headed peccaries), except for a dozen localities in Florida.” Wilson is unaware of 2 sites in north Georgia (Yarbrough Cave and Ladds) and 1 site in coastal South Carolina where fossil remains of flat-headed peccaries have been found. It is also illogical to assume a species was absent from a region based on its absence in the fossil record. Large areas of the southeast are devoid of fossils because the local geology is not conducive to fossil preservation, not because animals didn’t live there in the past. Wilson concludes flat-headed peccaries became extinct due to climate change based on 4 lines of evidence that are easily debunked. 1. He dismisses overhunting by humans as a cause of flat-headed peccary extinction when he regurgitates the tired old claim of Meltzer and Grayson (an archaeologist and anthropologist…not paleoecologists) that there isn’t enough archaeological evidence of human interaction (kill sites) with this species. I consider this reasoning absurd in the extreme. 99.999…etc% of animals that ever lived on earth left no fossil evidence whatsoever. It has always seemed unreasonable to me to expect the remains of the final populations of a species that overlapped with man for less than 2000 years to be preserved in the fossil record. The chances of this happening are tiny. I’ve noticed Grayson’s recent book published in 2016 is frequently being cited in new papers about Pleistocene vertebrates. Grayson was blatantly dishonest in this book in the way he characterized a study that rules out climate change models of extinction. (See: https://markgelbart.wordpress.com/2017/01/23/donald-graysons-disingenous-case-against-overkill/ ) Grayson lied and he knows he lied. 2. Wilson assumes flat-headed peccaries became extinct in this region about 22,000 calendar years BP because their remains don’t occur in cave sediment after this date. (When Wilson writes of extinction in his paper he means regional disappearance or extirpation because he’s aware terminal dates for this species in other regions are 11,000 calendar years ago. Nevertheless, he clumsily never makes this distinction in his paper.) He asserts peccaries became extinct here because the climate became too arid for them. Again, he is basing his assertion on the dubious assumption that the absence of evidence is evidence of absence. I think flat-headed peccaries were probably even more abundant during the arid climate phase because they were anatomically well-adapted to dry dusty environments. Flat-headed peccaries had extensive structures in their nasal passages that helped filter dust. Wilson must be unaware there are at least 9 fossil sites where herds of flat-headed peccaries were buried during sandstorms. (See: https://markgelbart.wordpress.com/2013/03/10/when-sand-dunes-buried-herds-of-flat-headed-peccaries/ ) This suggests they were common in desert environments. Flat-headed peccaries may have avoided falling in Peccary Cave after 22,000 calendar years BP because the area around the entrance to the cave was barren and not hidden by vegetation. None happened to fall in the cave after this date, but that doesn’t mean they didn’t still occur in the region. Other fossil sites in the region yield the remains of horses, but not a single horse fossil has been found in Peccary Cave. Horses were likely another abundant species in the region that just happened to never fall in or enter Peccary Cave. 3. Wilson did a stable isotope analysis of 2 flat-headed peccary teeth and concluded they fed upon just a few leguminous plant species, so they became extinct when these limited number of plant species disappeared from the region. I don’t believe the entire dietary breadth of a species can be determined from such a small sample size. Moreover, 1 study suggests stable isotope analysis is not at all reliable. (See: https://markgelbart.wordpress.com/2016/06/24/trust-the-coprolites-not-the-stable-isotope-analysis/ ) Scientists compared the results of a stable isotope analysis of moa bones with actual fossil droppings. The stable isotope analysis was wrong. Flat-headed peccary teeth were built to eat grass and tough vegetation. A species that survived millions of years of climate change didn’t exclusively feed upon just a few species of leguminous plants. 4. Wilson asserts flat-headed peccaries were uncommon and thus vulnerable to extinction. However, a new genetic study of 12 flat-headed peccary individuals from Sheridan Cave, Ohio, dating to just before their extinction revealed populations of this species were diverse and expanding. This suggests flat-headed peccaries were common, adaptable, and had a wide geographical distribution until the species’ demise. Peccary Cave has yielded a wealth of information for paleoecologists, and I’m shocked at how little research has been published about this site. I’ve been able to find about half a dozen research papers. There hasn’t been a scientific excavation of the site since 1993, though amateurs are currently pillaging it. Most of the specimens from this site have not yet been described in the scientific literature, and they are not listed on the paleobiology database. An early report of the site mentions the existence of peccary “droppings.” Yet, nobody has studied the coprolites (please email me if I’m wrong)–an outrageous oversight. We could actually find out what flat-headed peccaries ate, instead of guessing based on stable isotope analysis. I’m not sure the coprolites were even collected and stored in a museum. There should be hundreds of published papers about this site, not just a paltry 6. I’ve come across other understudied fossil sites and collections in my research, but this site might possible be the most underappreciated. The Coats-Hines site is located adjacent to a golf course. During construction of the golf course 40 years ago workers found the remains of a mastodon. Further digging by trained experts over the years yielded the remains of 3 more mastodons, white-tailed deer, muskrat, turkey, and painted turtle. This most recent paper noted the additional identification of ground sloth bones (probably Harlan’s) from the site. A mastodon vertebrae apparently had cut marks on it, suggesting evidence of anthropogenic butchery, and it was associated with supposedly human-made artifacts. In a paper published just 7 years ago the archaeologists wrote it was “unequivocal” evidence of human butchery. However, in his more recent study Jesse Tune admits the cutmarks could’ve been caused by the bone being tumbled against rocks in an high energy stream environment. He thinks the artifacts associated with that specimen are geofacts. A geofact is a natural stone formation that resembles an human-modified object. The stones come from local outcrops that naturally eroded into the stream. There are definitive human-made tools at Coats-Hines, but they were found some distance away from the mastodon bones. Coats-Hines was a former stream, and deposits of different ages can get mixed together when currents erode through different aged strata. Jesse Tune used what he learned from studying the Coats-Hines site to debunk claims made for the antiquity of the Topper site in South Carolina, and the Burnham site in Oklahoma. Archaeologists excavating these sites claim the evidence they found was older than the Last Glacial Maximum. (The LGM dates to roughly between 18,000 years BP-22,000 years BP.) Jesse Tune thinks the evidence at these sites consists of geofacts eroded from adjacent local outcrops that perhaps mixed with real artifacts of more recent origin in an high energy stream. The new paper (referenced below) includes the Coats-Hines site as a proposed pre-LGM site. This puzzles me because I can’t find anyone who ever claimed the artifacts and evidence from Coats-Hines dated to before 22,000 years ago. The sediment around the mastodon bone thought by some to be butchered by humans produced a radio-carbon date of 13,100 years BP (~=15,000 calendar years BP). This is well after the LGM. I always considered Coats-Hines to be pre-Clovis but not pre-LGM. It seems as if the authors of this paper are making a straw man argument because as far as I can determine, nobody claimed Coats-Hines was pre-LGM. Who claimed Coats-Hines was pre-LGM? I asked 2 authors of the below study but I didn’t get a response. Are they making a strawman argument about Coats-Hines? Rob Nelson stood next to a wall of fossils on 1 episode of Secrets of the Underground, a Science channel tv series. He was visiting Friesenhahn Cave in Bexar County, Texas about 20 miles north of San Antonio during the taping of the series he hosts. The tusk of a mammoth or mastodon, a baby mammoth tooth, and many small fossils were visible; and they were cemented together. It’s remarkable that such an undisturbed matrix could still exist here because people have been excavating fossils from this site off and on for about 100 years. Specimens collected by local amateurs were first described from this site in a paper published during 1920. For awhile the landowner stopped permitting people to collect fossils in the cave, but then in 1949 Mr. Friesenhahn himself invited some professors to excavate fossils in the cave. They found the complete skeletons of scimitar-toothed cats and a long-nosed peccary plus the bones of 30 other species of mammals and the remains of reptiles and amphibians. The discovery of the complete scimitar-toothed cat skeletons was important because before this the species was known from an incomplete skull, a few teeth, and some isolated bones. Large numbers of juvenile mammoth and mastodon bones were found associated with the scimitar-toothed cat skeletons, and the paleontologists came to the conclusion the big cats used the cave as a den and dragged their prey inside. A flurry of papers about the cave were published, but access was again restricted until Concordia University purchased the property in 1998. Apparently, since the purchase, some scientists have been working with the disturbed sediments, but they are waiting for a private or government grant before tackling the remaining undisturbed strata. I suppose they want to use the most modern techniques when going through this material. During the original dig 68 years ago, scientists mention fossils that were in such poor condition “they weren’t worth preserving.” (I was appalled when I read this.) There are modern methods that can preserve fossils that are in poor condition, but they can be costly. Scientists have also developed better ways of excavating fossils. Nevertheless, nothing has been published in the scientific literature about this cave since Concordia University purchased the property. It has been nearly 20 years, and they still haven’t been able to obtain funding for new excavations, though they do have a corporate grant to study the disturbed sediments. Still, it seems as if someone currently studying the cave would have at least published a paper by now entitled “Additional fossils recovered from Friesenhahn Cave.” To be honest, I am not impressed with their academic efforts here. Brief excerpt of an episode of Secrets of the Underground, featuring Friesenhahn Cave. A grate protects the cave from looters and keeps trespassers from falling inside. 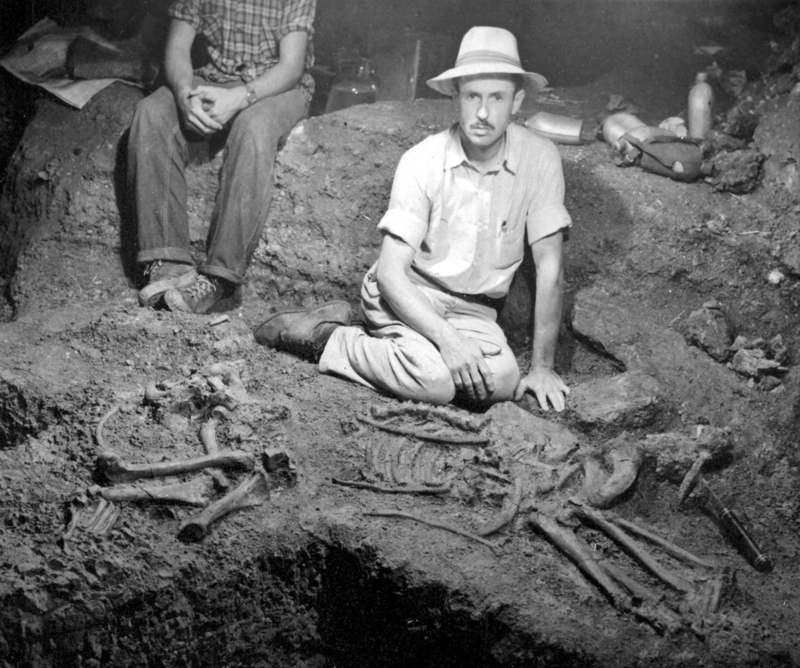 The paleontologist, Grayson Mead, with the complete skeleton of a scimitar-toothed cat discovered in Friesenhahn Cave during 1949. So far, 13 adult and 5 juvenile scimitar-toothed cat remains have been found in the cave. It’s unclear which of these were recovered in 1949 and which were discovered more recently. The cave has also yielded 1 bone of a saber-toothed cat, hundreds of baby mammoth and mastodon teeth, the bone of 1 ground sloth; and the remains of bison, deer, camel, tapir, long-nosed peccary, black bear, dire wolf, and coyote. The latter was especially abundant. Smaller animals that inhabited the area during the late Pleistocene, based on the bone accumulation in the cave, were jack rabbit, cottontail, desert cottontail, pocket mouse, and 4 species of mice in the Peromyscus genus. Some of these species are listed in the paleobiology database, and others are mentioned in the below referenced bulletin or on the Texas University website. The lists don’t match up. Someone needs to do a more thorough review of the specimens to determine exactly which species were found by whom and during which excavation. Evidence suggests a pond periodically existed in the cave, depending upon rain and drought cycles. The basin filled during rainy years but dried out during droughts. No fossil evidence of pond turtles exists here. Instead paleontologists report remains of 2 terrestrial species–a large extinct subspecies of box turtle and an extinct tortoise (Geochelone wilsoni) related to the extinct giant tortoises that ranged throughout the south during the Pleistocene. G. wilsoni is known from just a few sites in North America but was first discovered in Frisenhahn Cave. Pond turtles never found the ephemeral water hole in the cave, but northern leopard and barking frogs did. Diamondback rattlesnakes used the cave as a den as well. The species composition suggests the region around the cave was an arid grassland with some scrub. Woodlands existed alongside local rivers. The mammoth, bison, camel, coyote, and jackrabbit indicate dry grassland environments. However, the presence of deer, tapir, long-nosed peccary, and black bear suggest some woodlands or forest edge habitat existed nearby. The cave formed when rainwater dissolved limestone rock underground. The initial entrance was small, and the oldest levels contain small vertebrates deposited in the form of owl pellets. Gradually, the entrance enlarged so that larger vertebrates began to use it as a den. Some of the fossil remains are from animals that died in the cave, but others were brought in by predators. Periodic flash floods may have added small bones to the collection. Eventually, the cave entrance collapsed, and the chamber was sealed for thousands of years until recent times when a sinkhole formed on top of the cave, allowing modern day access. The remains are estimated to be 19,000 years old, but it’s unclear where this estimate originated. I’m unaware of any carbon-dating of the objects in this cave. It was originally discovered before carbon-dating was invented. The site is badly in need of a more modern review, and I’m not sure Concordia University is up to the task. In 2004 Hurricane Ivan spawned 140 mph winds, 90 foot waves, and the fastest sea floor current ever recorded. That incredible sea floor current removed a sediment layer covering a 60,000 year old cypress forest in the Gulf of Mexico. The exposed trees formed a natural reef, attracting a concentration of fish and other sea life 60 feet below the ocean surface and 15 miles offshore. Fishermen noticed the unusual concentration of fish and asked scuba divers to investigate. The scuba divers discovered the uncovered ancient forest, and scientists are now studying this rare site. The scientists who visited the flooded forest were impressed with the marine life they encountered–flounder, cardinal fish, red snapper, blennies, sea bass, moray eels, sandbar sharks, hawksbill turtles, octopus, boring worms, anemones, and sponges. But they were even more impressed with the ancient cypress wood they brought with them to the surface. They sawed through it in the laboratory and smelled fresh sap. Nevertheless, they couldn’t use radiocarbon dating because they discovered the wood was over 50,000 years old–too old for that method. Instead, they found the nearest organic material that could be dated and estimated a 60,000 year old date based on stratigraphic location and assumed rates of deposition. When it was alive, this flooded forest stood during a time period classified as Marine Isotope Stage 3. I am fascinated with MIS3 because the dramatically fluctuating climate cycles had a major impact on natural communities. MIS3 occurred just before the Last Glacial Maximum (the coldest stage of the last Ice Age), but unlike the LGM, MIS3 experienced warm interstadials alternating with cold phases. Many geographical regions hosted an admixture of northern flora and fauna with warm climate species of plants and animals because of this climatic instability. Tree rings on the fossil cypress wood excavated from this locality demonstrate this instability. The tree rings provide a 489 year record of climate from MIS3. The cypress tree rings show climate varied with warm wet years and dry cold spells but for the most part they are narrower than tree rings found in modern day cypress trees. This reflects a cooler drier climate with lower levels of carbon dioxide in the atmosphere. The trees were especially stressed during the last 50 years of their existence, and they all died at the same time, though the trees were of different ages. Saltwater intrusion killed the trees. Sea level rose rapidly here, probably during a warm phase of climate when glaciers were melting. Cypress wood is resistant to decay, an adaptation for living in aquatic environments, but when exposed to air will eventually rot away. The dead stand of cypress wood likely stood for decades, perhaps a century, before becoming covered in sand and mud. Thus sealed off from air, it was preserved for tens of thousands of years. Now that it is exposed to oxygen again, it will decay into nothing in a few centuries. Scientists cored into the mud around the trees and took samples of pollen to analyze the type of natural environment that existed here 60,000 years ago. Cypress, oak, and alder pollen dominated. The palynologist who analyzed the pollen composition (the data as far as I know is still unpublished) concluded the forest was a rare type that no longer occurs in the region. The closest modern analogue is classified as an Atlantic Coastal Plain Blackwater Bar/Levee Forest. This type of forest occurs in small areas near the coasts of North and South Carolina. Bar/Levee forests grow on soil formed on the inside bend of a river. Sediment accumulates here through deposition, and the area is seasonally flooded. (Indeed, this particular forest occurred alongside a river, and the paleomeander scar is still visible at the bottom of the ocean adjacent to the flooded forest.) Dominant trees in a Bar/Levee forest are cypress, river birch, laurel oak, overcup oak, willow oak, sweetgum, red maple, elm, and loblolly pine. The understory consists of holly and hop hornbeam along with red maple and ash saplings. The shrub layer is made up of blueberry, titi, sweetspire, grape, poison ivy, climbing hydrangea, Alabama supplejack, greenbrier, sweet pepperbush, violet, and sedge. Spanish moss covers the trees. Bar/levee forests are similar to bottomland hardwood forests but are distinguished by the abundant presence of river birch or water elm (Planara aquatica which is not a true elm). Macrofossils of Atlantic white cedar and palm have also been found among the dead cypress. There are small disjunct colonies of Atlantic white cedar scattered throughout the southeast, indicating it was more widespread in the region during the Ice Age. (See: https://markgelbart.wordpress.com/2012/03/11/the-discontinuous-range-of-the-atlantic-white-cedar-chamaecyparis-thyoides/ ) The presence of palm shows that climate, though cooler than that of today, was still warm enough for that species. I suspect this was a unique forest that doesn’t exactly match any classified natural community of the present day. 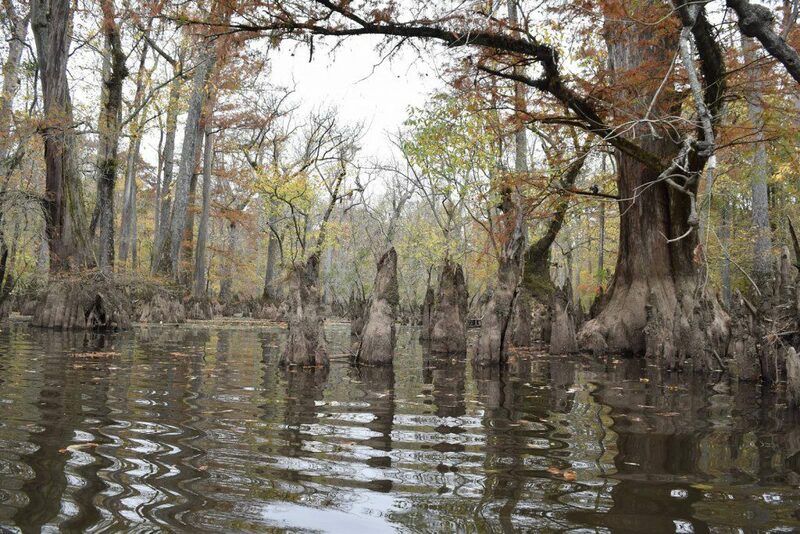 60,000 years ago, a cypress and oak forest grew at a location 15 miles off the coast of Alabama. It was rapidly inundated during a sudden rise in sea level, becoming covered in sediment before the cypress trees rotted away. The pollen evidence suggests alder was a pioneer species here that probably became established when the point bar of the river began depositing sediment. Cypress and oak became dominant for about 500 years. Then, after salt water intrusion killed the cypress, grass pollen predominates, suggesting a salt marsh replaced the cypress forest. Extinct megafauna such as mastodon, tapir, and capybara undoubtedly passed through this environment, but vertebrate fossils have yet to be found. Below is a documentary about the flooded forest–the source of information for much of this blog entry. I photographed a lesser yellowlegs (Tringa flavipes) at Woodbridge Lake, Evans, Georgia last weekend. I was thrilled to see this transient species in such an unexpected locality. Lesser yellowlegs and many other species of sandpipers spend the winter in South America, Florida, and the coasts of Georgia and South Carolina, but they migrate to their summer breeding grounds in western Canada during spring. The present day breeding grounds of 22 American species of sandpipers, plovers, curlews, and dowitchers were mostly or completely under glacial ice during Ice Ages. One might ask where these species bred during Ice Age summers. Weather patterns were much different then. Today, much of the west is arid desert, but during Ice Ages the region enjoyed a cooler and much wetter climate. Many large lakes existed in western North America, and they provided beach, reedy marsh, and open water habitats for aquatic birds. A large prehistoric body of water, known as Pleistocene Lake Manix, covered what today is the Mojave Desert, and Pleistocene Fossil Lake inundated the modern day site of a desert in central Oregon. Both of these sites yield abundant remains of the aquatic bird species that formerly spent all or part of their lives there. Map of western North America during the Ice Age. More precipitation and cooler weather patterns resulted in large lakes in place of present day arid landscapes. Lesser yellowlegs in Evans, Georgia. This species is a transient here. It spends winters in South America, Florida, and the southeastern Atlantic Coast, but breeds during summer in western Canada. Range map for a lesser yellowlegs. Many species of sandpipers have similar ranges. Almost their entire breeding range was under glacial ice during Ice Ages. They shifted their breeding ranges to the lakes in western North America that no longer exist and are deserts today. The entire breeding range of the white fronted goose, the blue goose, and 10 species of ducks was also under glacial ice during the late Pleistocene. The geese and some species of ducks shifted their breeding ranges to these western lakes. 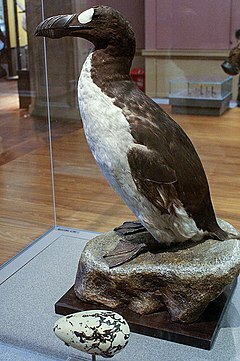 However, harlequin, eider, king eider, and the extinct Labrador duck have/had more easterly distributions and likely bred near the Atlantic coast south of the ice sheet. Other migratory species of birds that bred on western lakes during Ice Ages include whooping cranes, northern skuas, and arctic loons. Many species of aquatic birds that breed in western Canada during summer still breed in western states as well wherever wetlands still exist. Instead of shifting their breeding ground migration north, these species expanded their summer breeding grounds but still also nest within their Pleistocene range. This list of species includes 2 loons, 2 grebes, white pelicans, 2 swans, 10 ducks, sandhill cranes, Virginia rails, Hudsonian godwits, American avocets, 3 phalaropes, and 3 jaegers. The abundant large lakes of Pleistocene western North America attracted some species of non-migratory birds that no longer occur in the region. Anhingas are fish-eating birds confined to southeastern North America today, but fossil evidence shows they lived in Oregon during the Ice Age. The beautiful scarlet ibis no longer occurs north of Central America but ranged to Oregon then also. The scarlet ibis no longer occurs north of Central America but did live as far north as Oregon during Ice Ages. Western lakes evaporated and turned into desert following the end of the Ice Age. A number of species failed to adapt by shifting their ranges to newly available Canadian habitat, and they became extinct. The extinct species include a flamingo, 2 gulls, a jaeger, a cormorant, a grebe, a swan, a goose, and a shelduck. Breeding colonies of aquatic birds attract predatory species such as bald eagles and great horned owls. Fossil evidence of both these species is found at most of the sites of these former Pleistocene lakes. The extinct western lakes would have been a birder’s paradise. Paleo-indians saw the wealth of avifauna as a food source. Paleo-indians had no television, radio, and little in the way of entertainment, so perhaps bird-watching was a leisure activity for them after they filled their bellies with spit-roasted duck. Until recently, there was little fossil evidence of diamond-backed terrapins. This species inhabits salt marshes and mangrove swamps from the Gulf of Mexico to Cape Cod, Connecticut. For most of the past 2 million years, sea level has been much lower than it is today due to the larger ice caps of long-lasting Ice Ages. This means many potential fossil sites where the remains of terrapins might be found are submerged deep underwater and difficult to access. 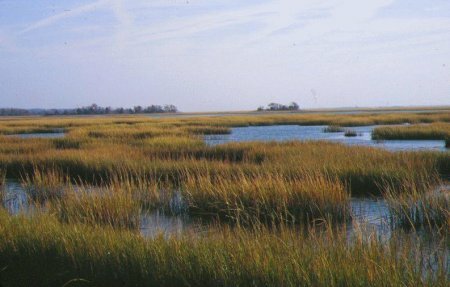 Sea level has been the same or higher than it is today probably for less than 20% of the last million years, and this reduced the chances easily accessible fossil sites developed in salt marsh zones. However, the remains of terrapins dating to the Pleistocene have been excavated from 3 sites in Florida, 1 in Georgia, and 1 in South Carolina. These specimens weren’t described in the scientific literature until 2012. The diamond-backed terrapin is adapted to living in salt marshes. Diamond-backed terrapin habitat–a salt marsh. The 3 sites in Florida where Pleistocene-age terrapin remains were discovered are Page-Ladson, Aucilla River, and Wekiva River. Terrapin material turned up at Edisto Beach, South Carolina, and fossil hunters found terrapin bones in spoil piles dumped on Andrews Island, Georgia. (All of Andrews Island is manmade, consisting of spoil piles dredged from the South Brunswick River, aka Fancy Bluff Creek. The Army Corps of Engineers periodically dredges the river to keep it deep enough for safe shipping. Plants have taken root there and it is an haven for wildlife.) The specimens are thought to be Pleistocene in age because they are associated with bones of other species that lived then. The 3 sites in Florida and the 1 at Edisto Beach commonly yield bones of extinct Pleistocene mammals. The spoil piles on Andrews Island contained the remains of snapping turtles (Chelydra serpentina), yellow-bellied cooters (Trachemys scripta), and the extinct giant tortoise (Hesperotestudo crassicutata). These species all lived during the late Pleistocene. The presence of these 3 species along with the terrapin indicates the local environment at the time of deposition was a brackish marsh bordering an open grassy savannah. Snapping turtles and yellow-bellied cooters are fresh water species that can tolerate brackish conditions, and giant tortoises preferred dry land environments. Terrapins are not closely related to sea turtles. Morphological and genetic evidence suggests they are most closely related to freshwater turtles in the Graptemys genus. In North America this genus includes 10 species of map turtles and saw backs. Terrapins are the only turtle species uniquely adapted to live in salt marshes. They have lachrymal salt glands that help them get rid of excess salt. These are absent on all species of fresh water turtles. Terrapins are also able to drink the layer of rain water that temporarily floats on top of salt water. Terrapins feed upon shellfish–periwinkle snails are their favorite but they consume shrimp, crabs, and bivalves as well. The salt marsh periwinkle (Littorina irrorata) is the diamond-backed terrapin’s favorite food. Terrapins were formerly so abundant they constituted the main source of protein for coastal slaves during the 18th and 19th century. But a faddish craze for turtle soup circa 1900 greatly reduced their numbers. All of the finest restaurants served turtle soup, and it was the most expensive item on the menu. I’ve only had the opportunity to eat turtle meat once. Turtle meat is very delicious, tasting like lobster. Because terrapins feed on shellfish, their flesh likely reflects their diet. Terrapins are presently a protected species but are still considered threatened. Real estate development destroys their habitat, they drown in crab traps, cars run over them, and there are people who still eat them. Egg-eating raccoons flourish as well, since most large predators that kept their population in check no longer exist on the east coast. If I get the urge to eat turtle again, I’ll stick with the common snapping turtle which as their name suggests are still common. Despite the universal chorus of politicized alarmists, earth is currently experiencing a period of relative climatic stability compared to the dramatic climatic fluctuations that occurred during the Pleistocene. The presence of vast ice sheets in the northern hemisphere contributed to this ancient climatic instability. Glaciers blocked rivers, creating huge glacial lakes. Warm spikes in average annual temperatures weakened the ice dams and caused breaches. Massive outflows of frigid fresh water and icebergs periodically flooded into the North Atlantic, shutting down thermohaline circulation. The gulf stream normally carries tropically heated water into the North Atlantic, and this keeps overall climate temperate, but after torrents of cold fresh water stopped this process, average annual temperatures dropped as much as 15 degrees F in less than a decade, precipitating severe stadial conditions that lasted for hundreds or even thousands of years. These meltwater pulses are known as Heinrich events, named after the scientist who first recognized this cycle. During Ice Ages warm stages of climate cyclically caused glacier dams to burst, releasing massive amounts of cold fresh water plus icebergs. This shut down the North Atlantic Gulf Stream which brings tropically heated water north, resulting in a sudden decline in average annual temperatures. A graph showing average annual temperature fluctuations over the last 100,000 years from data gleaned inside Greenland ice cores. Cyclical Heinrich Events caused the sudden declines in temperatures. I assumed Heinrich Events severely disrupted marine ecosystems, causing decisive population declines in most fish and other ocean fauna, though a few species may have benefitted from reduced competition or other factors. But I thought there would be no paleontological evidence because preservation and detection of animal remains during brief time intervals in marine environments seemed unlikely. However, a recent paper highlights evidence that Heinrich Events were detrimental to marine life. Scientists found this evidence in a seaside Sicilian cave named la Grotta Dell’Uzzo. This cave had previously revealed the Pleistocene remains of mammoth, rhino, lion, red deer, and wild boar. Humans have also periodically occupied this cave from the late Pleistocene through the Holocene, and scientists have excavated human skeletons, artifacts, and food remains. Chemical analysis of human bones found in the cave helped scientists determine the diet of the hunter-gatherers who occupied the cave during the early Holocene. They ate red deer, wild boar, shellfish, fish caught near shore (such as grouper), acorns, grapes, and wild beans and peas. However, 1 human specimen and 1 red fox bone, dating to 8200 BP, revealed an interesting difference. Both the human and the fox ate unusual quantities of whale meat during their lifetimes. Red foxes don’t normally include whale meat in their diet, and humans from other generations of cave dwellers here hardly ever exploited this resource. Moreover, whale bones with butcher marks on them were found associated with the human and fox specimens in the same strata. The scientists who examined this evidence determined humans exploited climate-driven whale strandings at this locality. Mass stranding of pilot whales in Australia. Heinrich Events disrupted marine ecology and caused high annual mortality among many species of whales. Evidence of early Holocene mass whale strandings was discovered in this seaside cave in Sicily, known as la grotto dell’Uzzo. 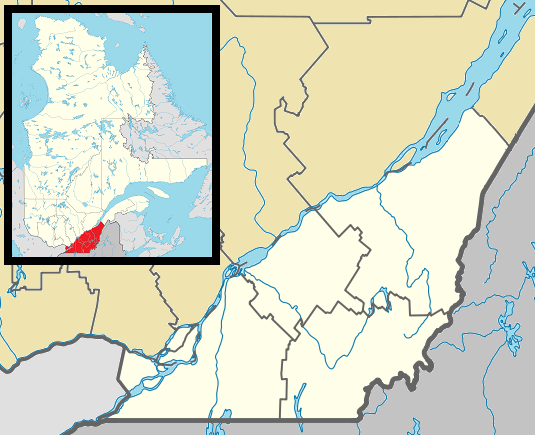 The last major Heinrich Event occurred 8200 years ago, following the final dissolution of glacial Lake Agassiz in Canada. This massive meltwater pulse disrupted fish migrations and reduced fish populations, making it harder for many species of whales to find prey. Stressed and malnourished whales are more likely to strand on beaches. The Gulf of Castallammare, adjacent to la Grotto Dell’Uzzo, is an acoustic dead zone difficult for whales to navigate. This is where frequent, probably annual, whale strandings occurred for centuries, and the evidence suggests humans and foxes exploited this resource. Based on the zooarchaeological record, the most common species of whales stranded here were pilot whales (Globicephala melus), Risso’s dolphin ( Grampus griseus ), and short-beaked common dolphin ( Delphinus dolphio ). Frequent whale strandings likely occurred worldwide following Heinrich Events. Off the coast of North America dire wolves, bears, and other large carnivores scavenged this wealth of protein during the Pleistocene. There were certain spots, such as the 1 in Sicily, where carnivores learned to regularly search for this bounty. Carnivore populations may have been higher near the coast due to this additional resource. Unfortunately, evidence of these sites were long ago inundated by rising sea level. About 30 years ago I took a business class at Augusta College that revealed 1 of my most disappointing shortcomings. The professor separated us into groups of 7, and we were assigned topics for discussion everyday. After several weeks of discussions the professor told us to rank group members in order of most to least influential. I ranked myself 3rd and felt it was a fair assessment. But I ranked 6th in the overall average of everybody’s rankings. Much to my astonishment, I was ranked well behind a guy (that I ranked last) who often showed up to class tripping on acid and had not spoken 1 word during the entire assignment. It was then when I first realized I had no influence, and I felt so depressed I almost cried. It explained why I had such a hard time getting women to go on dates with me. It explained why ridiculous jerks who continuously misused and abused women could get any dates they desired, while I was lucky to get a condescending rejection, if the woman even acknowledged my attention at all. I’m a nice guy, but I have no influence. Hitler…not a nice guy…was the single most influential man to live during the 20th century. I used to feel sad about my lack of charisma, but when I think about this, I don’t feel as bad. My late father survived the holocaust in Buzcazc, Poland. One day, the Nazis ordered all the adult Jewish men to the town soccer stadium. My grandfather decided not to obey that order, although he considered it. That night, my father’s family heard shots from the direction of the soccer field and a few minutes later, an athletic man who ran and escaped, told them the Germans lined up and shot all the Jewish men in attendance. Shortly after this incident, my grandfather paid a Ukrainian farmer to hide his family in an hayloft. There, 6 people lived on a very low calorie diet for 2 years before they were liberated by the Russian army. However, all of my father’s grandparents, uncles, aunts, and cousins were killed in concentration camps or shot upon initial confrontation. My father always liked to watch WWII movies because they depicted the killing of Nazis. Until his death, he never tired of watching “killing Nazis”–his term for his favorite war movies. My dad would have enjoyed a movie about the Russian military campaign in Latvia during 1944 that occurred to the north of where he was liberated, but Hollywood has yet to depict this battle. The Russians trapped 350,000 German soldiers here. They killed 100,000 and captured the rest. 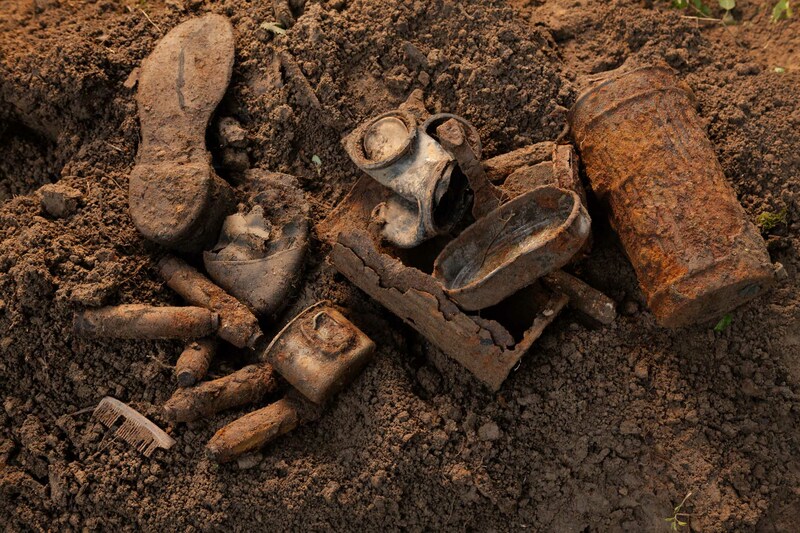 All of the bodies were buried near where they were killed, and the blue clay soil helps preserve the Nazi skeletons and artifacts that litter the subsurface of the Latvian countryside. Location of Latvia. The Russian army trapped 350,000 German soldiers here. 100,000 were killed and buried on the battlefields. In many rural areas live humans are outnumbered by buried German corpses. Rural Latvia is an economically depressed region and most of the people who lived there moved to the city or to other European countries. So in many places, Nazi corpses outnumber live people. The old poor alcoholics who remain often dig up Nazi graves and sell the artifacts for cash. German army dog tags sell for $60. SS dog tags sell for several hundred dollars. An helmet can fetch $90. The market for Nazi artifacts is strong and can be lucrative. According to Bloomberg Businessweek, “Herman Goering’s sweat-stained uniform” sold for $126,000. An orthodox Jew bought Josef Mengele’s diary for $245,000. The same properties in Latvian soil that have preserved Nazi skeletons also saved paleoecological evidence dating to the Pleistocene. Stratigraphic cores reveal evidence of past fluctuations in climate alternating between temperate, cold, and full glacial. Pollen analysis shows a forest of elm, basswood, and hazelnut predominated during warm interglacials. Immediately before and after glacial maximums the environment consisted of grassy steppe with pockets of birch, alder, spruce, and pine. Glaciers have entirely covered Latvia during the glacial maximums of the numerous Ice Ages that occurred over the past 2-3 million years. Over 40 specimens of mammoths have been excavated in Latvia (impressive for such a small little studied area), and caribou remains are common as well. A Latvian can dig in their backyard and find Nazi skeletons, and if they keep digging deeper, they might find the remains of a mammoth too. You are currently browsing the archives for the Fossil Sites category.